Last Thursday I was sitting in the sun in Amalfi and enjoying lunch outdoors overlooking the Marina Grande beach. There were a few brave souls making their way slowly out into the cold water and returning soon enough to lay in the warmth of the sun. Spring is just about to burst open here on the Amalfi Coast, and everything from trees to tourism is coming back to life. 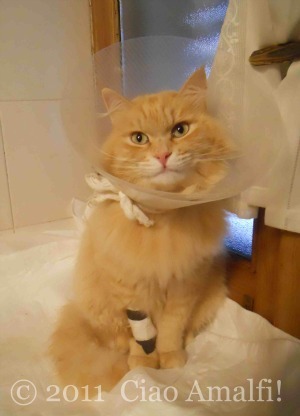 The next morning my cat, Puffy, showed up in the garden in terrible pain. 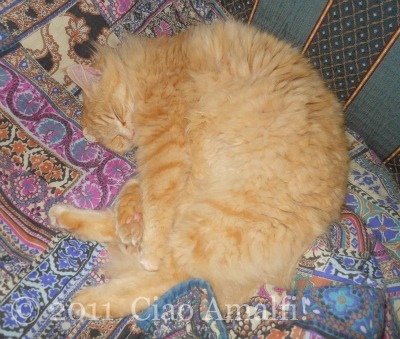 We rushed him to the vet’s office in Maiori to find that he had a urinary block. Tests were done and there has been no significant damage to his kidneys, so thankfully he hadn’t been blocked for very long. We remembered that he seemed quite normal Thursday evening. With a catheter, the IV attachment in his front arm and a cone around his head, the following few days (and nights) were very long. As I sat for hours next to him in the bathroom to keep him calm, I had a lot of time to focus on certain ideas that have been in my mind for months now. One of the words that kept coming back to me was gratefulness. As Puffy purred away while I sat next to him—even when he was in pain—I realized that was his way of telling me how grateful he was for me being there beside him. I thought about how grateful I am, in turn, for all the happiness he has brought us, and how insignificant and easy it is to give him this time and a few nights of sleep. I am grateful that he is recovering now and for this time helping him along that road. It was time that I needed to spend away from my busy schedule. It’s easy to be grateful for the good days when the sun is shining and life seems easy. But what about the other days when you’re exhausted, frustrated or worried? I realized I don’t want to miss those days. I want to be grateful not only for the good days, but also for the challenging days, the long days, the stressful days. There is something in each of those days to be grateful for – if only the purring of an animal that is grateful for your love and care. It was wonderful to arrive back on the Amalfi Coast earlier this week and find that I didn’t miss the arrival of spring. This is one of my favorite times of the year, watching the trees bud and blossom. 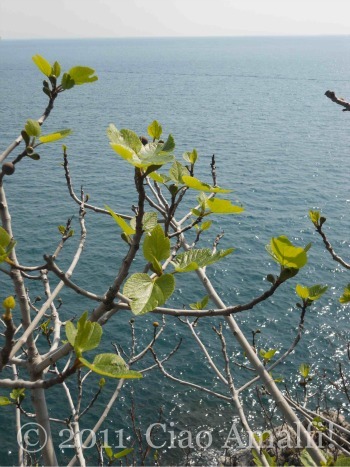 In Amalfi on Wednesday I was looking down at the sun sparkling on the sea and noticed the bright green leaves on this fig tree. You can even see the little figs growing. Spring is here! One of the small pleasures of going away is coming home again. When you love the place where you live, it becomes like an old friend that you haven’t seen in awhile. You notice, perhaps, how they’re wearing their hair in a new way or the new glasses. With a town like Amalfi, it’s the small details that jump out, like new signs, a store that redesigned their interior in a modern style or the arrival of tourists. Walking around Amalfi this morning in the sun felt good, and everywhere I looked my eyes were eagerly searching out the familiar and the new. Anyone who has made the jump to live in another town or a different country, will know how it feels to see a friendly smile welcoming you back when you’ve been away. Sure, big city anonimity has its advantages at times, but after experiencing the warmth of the Amalfitans, I don’t think I could go back. Over the past four years I’ve been constantly amazed by how friendly the people of Amalfi have been to me, and by how they have welcomed me into their community without treating me differently for being the americana that I am. It’s good to be missed in the place that has become my home. 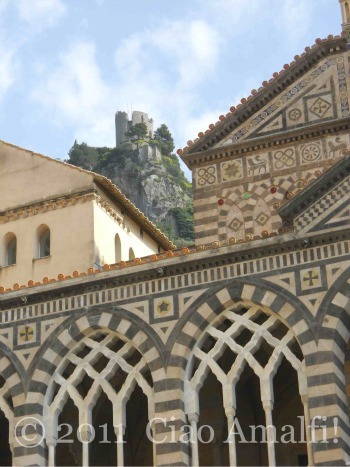 One of the first spots I go in Amalfi is the Piazza Duomo in the center of town. 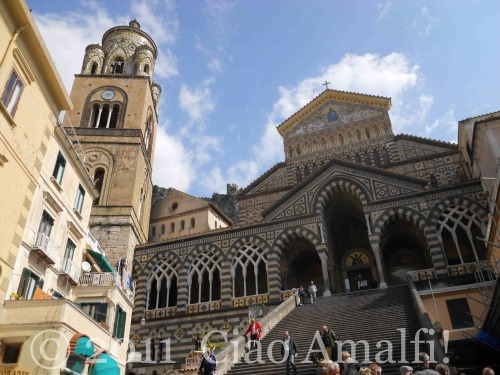 When I left in February it was the winter quiet time in Amalfi, and today it was a nice surprise to walk into the Piazza and see the early spring tourists groups gathered on the steps of the Duomo. The shops were open, many of them having been repainted or redecorated over the past month, and there’s the distinct feel of the busy summer ahead in the air. While the tour guide greeted one of his colleagues from Naples who was in town with his group, I couldn’t resist pulling my camera out and taking a few (more) photographs of the Duomo of Amalfi. It’s beautiful in the spring. Who am I kidding? It’s beautiful all year! I think I feel like I’m back home on the Amalfi Coast when I see the facade of the Duomo of Amalfi again. I could stand and gawk at it for hours. (I wrote my masters thesis on it so I’d have an excuse to do just that for as long as I wanted.) Even though it’s become so familiar to me, I love how certain details stand out when I’ve been away for awhile. Today I noticed the Torre dello Ziro watchtower high in the mountains. You can spot it in the photograph above just between the ornate facade of the church and the roof of the oldest area of the church, today called the Basilica of the Crucifix and home to the Duomo Museum. It reminded me that it’s time to hike to the Torre again soon, especially during this beautiful spring weather! 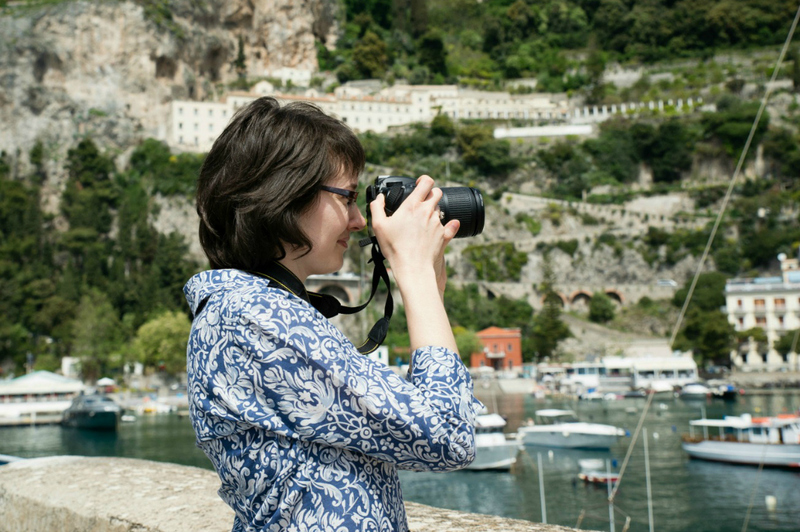 It’s good to be home again, just in time to watch springtime and all its beauty on the Amalfi Coast! A couple of weeks before I left Italy for this trip to America, I walked for the first time along the Via Maestra dei Villagi, an ancient footpath that connects Amalfi with the hamlets of Pastena, Lone, Vettica and high up in the mountains to Tovere and Pogerola. 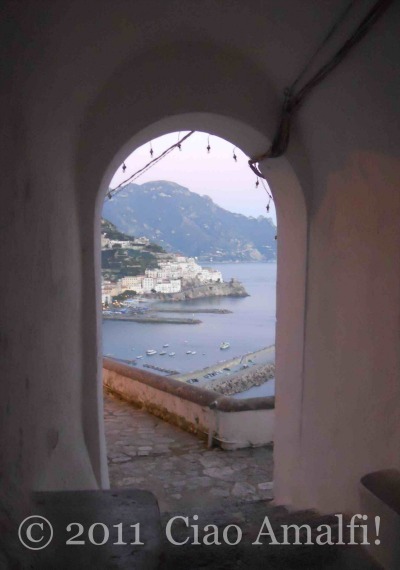 We walked it at sunset from Lone down to Amalfi, and just as we walked through a covered passageway next to the Church of Santa Maria del Pino we caught this evening view of the harbor of Amalfi from high above. I miss moments like this when I’m far away! Going back to a familiar place, whether be your hometown or a city where you spent many years, is a strange mixture of emotions. When I landed in the Minneapolis – St. Paul airport recently for a visit back where I went to graduate school, it was comforting to know exactly where to go. Even the smell of the airport brought back so many memories. My feet led me down the right escalators, around the corners and to the Hiawatha Line Light Rail heading toward downtown Minneapolis. I didn’t even have to remind myself to stop and pay attention. The train went past the stop where I used to get off and walk a few blocks to where I lived. But instead of getting off I stayed on one more stop to go to where my good friends live. That was the moment I became a visitor again. As I saw the same areas where I used to drive and walk and shop, I kept finding visual reminders of my absence. A building that told me it was time to take a right turn to my friend’s house was completely gone. New coffee shops had appeared, including an excellent Peace Coffee Shop. Yet, some places, like the Birchwood Cafe, had thankfully not changed a bit. “Strange” is perhaps the only word that describes that funny feeling in your stomach when a place that was so familiar suddenly is different. 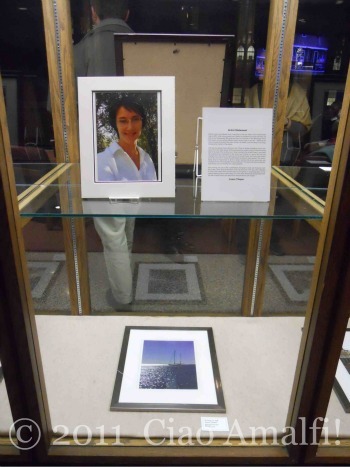 It was with this softening of past and present memories in my mind that I went to the artist reception for The Vision Changes – The Eye Remembers art exhibit at the University of St. Thomas on the first night I was back in the Twin Cities. There it was right in front of me. A brand new building being constructed on the corner where I used to park my car. The eye remembers everything. I have missed the very dear friends I made during my time in the Twin Cities and as a student in the Art History Department at St. Thomas. There are no words or emails or phone calls that can make up for a hug, spending time together, laughing and talking. 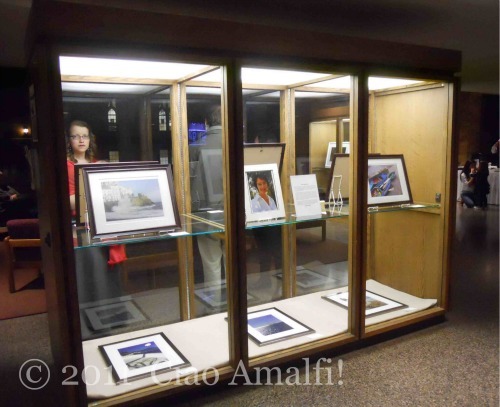 I am honored that some of my photos were selected for this exhibition, and even more so once I saw the beautiful work on display by the other artists in this group exhibit. I saw many familiar faces that night and met some lovely new ones. That night will be one of those sweet and happy memories that I’ll return to again and again. 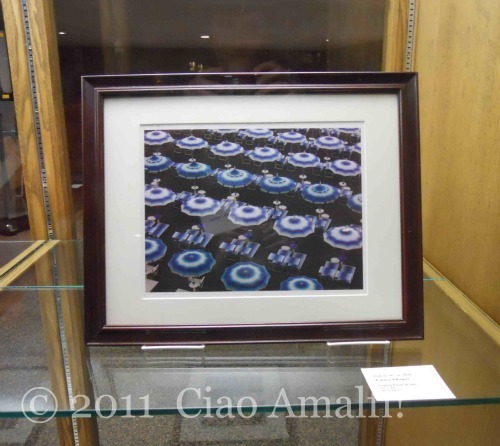 As promised a couple of weeks ago, I have a few photos from the exhibit to share here. I was so busy talking that I only remembered to snap a few right before leaving. It’s good to go back to where you came from. It’s good to go back to the places you loved. It’s important to hug the people that we hold dear in our hearts. Those people and those places change – it’s inevitable – but the emotional response and memories that are captured in what our eyes remember will always be the same. Thank goodness for that!